Beginning with drinking, beers are $4.00. 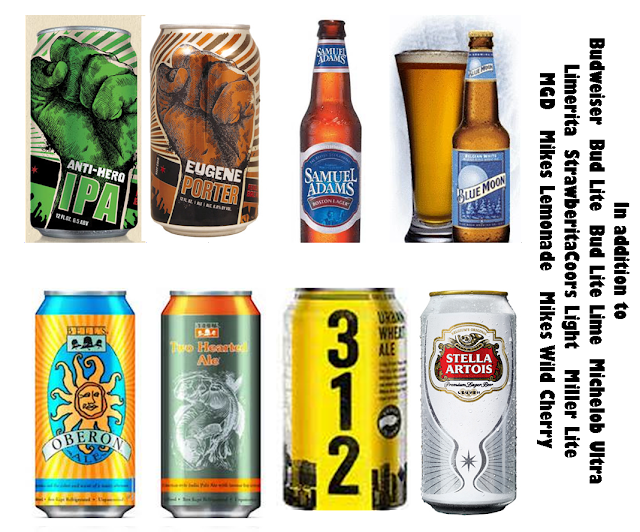 You can have the standard fare of many of the Bud, Miller and Coors products or the sweet stuff that Bud and Mike's make, or you can sample these fine beers. We've got a great IPA and Porter from a craft brewery in Chicago, Sam, Blue Moon, two of Oberon's nice ales, Goose Island Wheat beer and Stella. Not a bad selection! Pop and water will be only a buck! Food is also important. We've got a few vendors with some great stuff. Smokehouse BBQ has their fare to sample, Anjan's Eats has bourbon glazed chops and all sort of other good stuff and Take Outz is offering Italian beef and sausage. There will be some more good stuff, too!